Black Dog & Leventhal, 9781579127930, 112pp. Look out, Doofus! It's time to learn a thing or two about becoming a Darling. 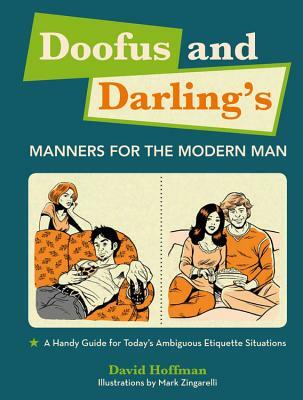 This wildly entertaining book presents the dos and don'ts of adult predicaments?such as proper etiquette for the morning after, sharing household chores, and making smart decisions?with a breezy and sly humor. No longer do men have to wonder whether they're supposed to call after the first date, what the protocol is for leaving the seat up or down, or how to deal with a gift they hate. Doofus and Darling combines witty text and edgy illustrations in an uproarious collection of good (and bad) manners for a new generation of social situations. Every aspect of men's behavior that women complain about, such as "Self-control and lack of it," "Learning good work habits," "Paying attention," and "Being sincere," is addressed here with a nudge and a wink. Hilarious as well as helpful, this collection is a perfect gift for any man who says he wants to make a woman happy?and for every woman who wants to commiserate with her friends. Mark Zingarelli works out of his studio, The House of Zing. His illustrations have appeared in New York magazine.